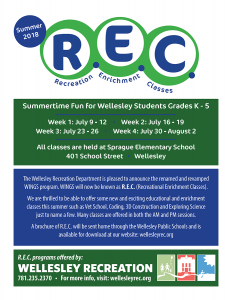 REC summer programming is open to all students who attend Wellesley Public Schools. The Wellesley Recreation Department is pleased to announce the renamed and revamped WINGS program. WINGS will now be known as R.E.C. (Recreational Enrichment Classes). We are thrilled to be able to offer some new and exciting educational and enrichment classes this summer such as Vet School, Coding, 3D Construction and Exploring Science just to name a few. Many classes are offered in both the AM and PM sessions. Astrid Mazariegos is on the on-site program coordinator for WINGS. Chad Norton is the contact person for the Wellesley Recreation Department. QUESTIONS? Any concerns or questions can be sent to wings@wellesleyps.org or cnorton@wellesleyma.gov. We will do our best to respond to them in a timely manner. The WINGS program runs at Sprague School in Wellesley which is located at 401 School St., Wellesley, MA 02481 Directions. The Wellesley Recreation Department provides online program registration. Online registration spaces will be limited, which will allow those who do not have access to the system to register using other methods. We HIGHLY recommend that you sign in to the online system a few days before registration to make sure that your account is working properly. You will need a username and password in order to utilize the online program registration system. Call the Recreation Office at 781-235-2370 during regular office hours (M-F, 8:30am-4:30pm) to receive your username and password. Adults must accompany their child to the first class each day. Students leaving at the end of the AM session should be picked up at 11:45 am on the sidewalk in from of the school where they will be waiting with the teachers. You may use the LIVE car line or park in the large parking lot and walk to meet your child. Please do not attempt to park in the semi-circle. If your child will be picked up by someone other than the parent, we must be notified in writing of who will be responsible for picking up your child that day and give the information to the Director on site. We will notify your child’s teacher. If your child has any medical issues, please plan to meet with the R.E.C. nurse. Remember to bring all necessary documentation with your the first day your child attends. Children entering Kindergarten will need to provide us with current health forms and immunization records.